If you want to find a high-quality and multifunctional headset, the Wireless Stereo Bluetooth Headset is your best choice. The Multifunctional headphone combines the Bluetooth, Card MP3 player and FM Radio function, and supports hands-free function. With this product, you greatly enjoy the wonderful wireless music, listen to FM radio, and it also can be worked as a MP3 Player because it supports Memory card (Micro SD / TF card). Moreover, don't worry, if your music players (Such as, MP3 / MP4, etc) have no Bluetooth function, you can connect the music players to the headset via the included 3.5mm audio cable to enjoy your favorite music. The leatherette ear cushion can greatly insulate the noise around you, so you can hear your music and call clearly. The over-the-head styling is stable, lightweight and comfortable. High-quality, foldable design and adjustable headband length, very comfortable to wear and easy to carry,3.5mm audio jack, provides a simple wired connection of a variety of music players (Such as, MP3 / MP4, etc) without Bluetooth function. DSP noise cancellation, bring you clear sound effect,Be designed with two High-grade speaker and has built-in Mic,, powerful bass system, bring you superior sound effect. 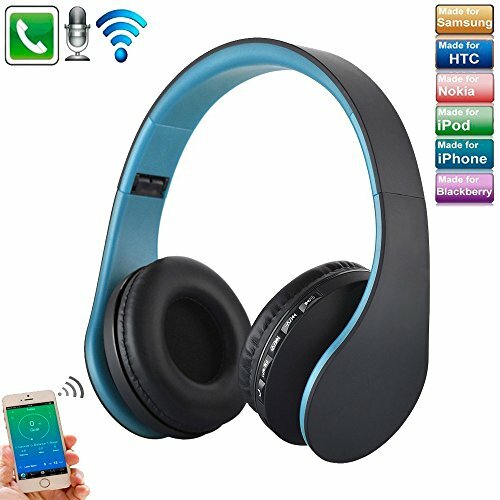 Best choice for listening to music / FM Radio, watching movie, chatting online, etc，Supports hands-free function, conveniently answer the incoming call during travel. With built-in high-quality rechargeable Li-ion Battery, and easily charged by the included USB cable via computer, Low power consumption, bring you 8 hours of talking time, 8 hours of music playing time and 120 hours of standby time.